Designing the cardboard carnival was an intricate process that took a few days. We started out with crazy ideas, including dropping things from the second floor, golfing from an airplane, and throwing diamonds at fish. The planning stage started out with a giant piece of paper to brainstorm our insane ideas. After the planning stage, we collected materials. Tons of cardboard, duct tape, and hot glue were amassed. We started building our games, with nothing but ideas, cardboard, and duct tape, we set to work making our dream games come to life. We spent a few weeks building the games. 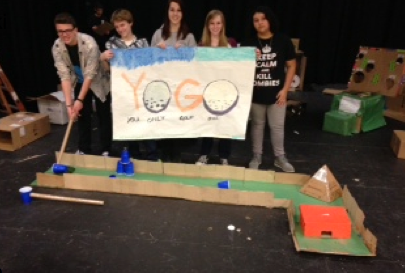 This project helped the leadership students learn how to work together. Seventh and Eighth grade leadership students formed into groups of four or five. Creating unique games for people to play. Fear struck the hearts of the creators when over a hundred and fifty kids stormed into the PAC. We only expected fifty and wow were we intimidated. For half an hour, we managed lines, told kids to stop cutting, and awarded prizes. Leadership students learned just how hard it was to be a teacher, managing a hundred and fifty kids with the help of only Mr. Darmanin was a fun and challenging experience. 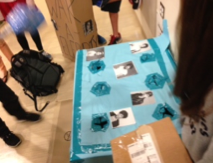 “Very fun, cool, and surprising that you can make games out of cardboard” -Madeline M.
“I thought the photo booth was very fun and enjoyed taking pictures” -Cassie A. Many of the kids at the Carnival were Sixth Graders, however, lots of older kids showed up as well. 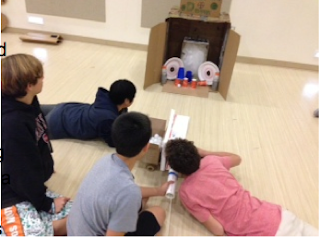 Many kids came to the first annual Cardboard Carnival and tried their luck at the numerous games. Many won prizes, and we can’t wait for next years cardboard arcade!! If I had to whack a celebrity, I would whack Justin bieber and Big Time Rush. If i were to participate in the cardboard thing, i would make a Crane to grab prizes. I thought it was very fun and I want to make one next year. I liked all of the ideas, if I went I would play whack-a-celebrity. I also liked "golfing from the airplane" I think if I tried it I would like it. Why did you have to put One Direction for the Whack a Celebrity? We LOVE them! YOGO sounds awesome i wish i could have gone.Around the World basketball seems interesting, I wish I could have played. that is so cool! I wont to do this when I am in 7th grade. Good job making such cool games. Looked like a lot of fun, even though I didn't get to go. Hope they have one next year. good and is a lot of fun.